Existing in the "medical supplies" Bambang area of Sta. Cruz district of Manila for decades, Lola Ely's Tapsilog is an institution that has withstood the challenge of omnipresent fast food restaurants and the urban blight of Avenida due to malls and LRT. 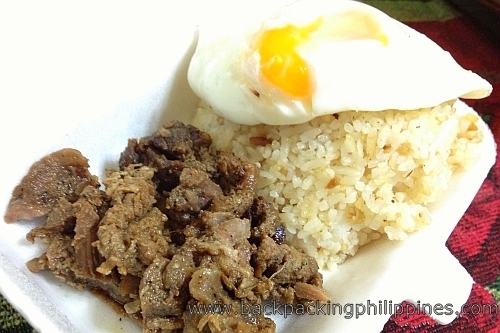 Lola Ely's Tapsilog Atbp serves tender, juicy tapsilog (a Filipino portmanteau of tapa (cured meat), sinangag (fried rice) and pritong itlog (fried egg)) that began as a breakfast meal but now eaten all time of day. the open air restaurant of Lola Ely's Tapsilog, beside Donna's Tapsilogan. street side parking is available. 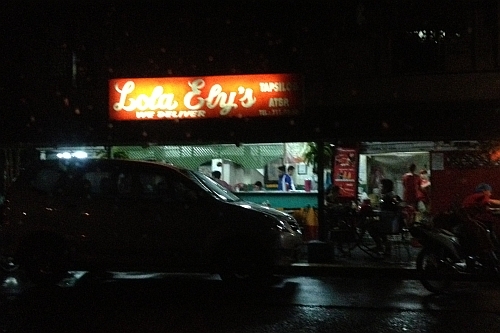 Lola Ely's is one of Tutubi's favorite tapsilog joints in Manila, open 24 hours a day and just within walking distance from LRT Bambang Station. Exact address is Bambang corner Felix Huertas, Sta. Cruz Manila. They also deliver within a certain area, just call their telephone number. Tutubi wishes to reverse engineer the secret tapsilog recipe of Lola Ely's, comparable to that of Hidden Tapsi of kawit, Cavite. driving directions, easiest (but not fastest) from Makati is via Buendia, turn right to taft Avenue and drive all the way to Manila City Hall, pass MacArthur Bridge, Avenida (Rizal Avenue) then turn right to Bambang St.